1) I like to have album art full depth of the App, taking up the left side of the screen. This can be done, but, when MM is closed and reopened the album art takes up just a tiny part of the top of the album art panel and, if looking at details, for instance, you get a scroll bar. Underneath the now tiny album art is a blank gap that seems to be acting as a panel - but no such panel exists. MM just seems to think there's one there. 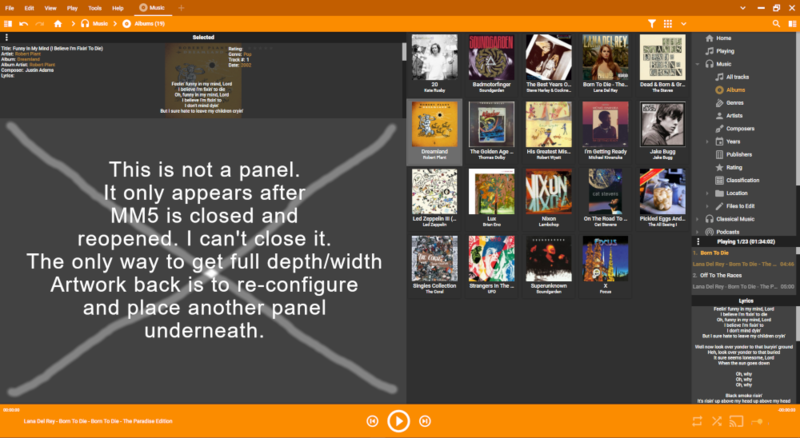 If I actually put any panel (such as lyrics) under the album art panel there are no problems. 2) Viewing the sound bar visualisation often crashes the app. It seems to appear in the album art panel but only half (width) of it shows. 3) Starting MM5 automatically brings up MM4 as well, maxing out my CPU. Only way to use/test MM5 is to constantly shut MM4. MM 5.0.0.2167 (Portable) Running on PC C: Drive, Top level in "Portable Installations" folder. 1) Thanks, I see, there needs to be at least one component below the 'Art & Details' so that it stays enlarged. This will be fixed, until then the workaround is to add a component like 'Lyrics' below it, but keep it disabled in Options. 2) I cannot replicate, did MM5 generate a crash log that you submitted? If not, could you please generate standard debug log using the DbgView, it is item 4b here: https://www.mediamonkey.com/forum/viewt ... 30&t=86643 ? 3) Which way you auto-run MM4/MM5 ? Do you mean from file explorer or automatically after Windows startup? Hi. Great news about problem 1). Regarding the crash when using the visualiser, I have found that it produces a blank screen on second use which can be removed with the escape key. Please see images in further post below. Problem 3 is really annoying. MM5 is a portable installation completely within its own folder. I haven't tried to install any add-ons at all and it is looking at a totally different music folder on a different drive. There should be no link to MM4 at all. When I run MM5, after a few minutes, MM4 will boot. If I close it, it just reappears a couple of minutes later. Interestingly, MM4 sometimes re-boots on it's own after closing (only once in a while though). Although I have upgraded to Win 10 and this behaviour happened on both W7 and W10, it wasn't a clean install, so guess something could be hiding somewhere in a setting or registry entry? Thanks for a great looking program that I am really excited about seeing the final product. Also thanks for the quick reply. Last edited by Richard127 on Wed Apr 10, 2019 7:37 pm, edited 1 time in total. Here are a couple of screen grabs for Visualisation problem (I have realised, it doesn't crash MM5, it just displays a blank window, which I found I could get rid of with the escape key). First Image which happens after a fresh boot of MM5 and first use of any visualiser... Basically, the visualiser is underneath the Album view. I can pull it across to the right to see more of the Visualiser, but I assume it should either be in full screen or in it's own window? Second Image. This happens after closing the visualisation and re-starting. It won't come back until re-booting MM5 and then only works first time again. Could it be an auto-play handler registered for MM4? e.g. inserting a device / SD card / audio CD could launch MM4 then. Or go to MM4 > Options > OS registration and uncheck the auto-play handlers there. Thanks Ludek but I have decided to uninstall MM4 and switch to MM5, despite the few bugs. I have kept the album database and it loaded into MM5 really quickly and seamlessly. Pretty good for a 90,000+ track list. If I install MM4 again, I will take your advice - Thanks. 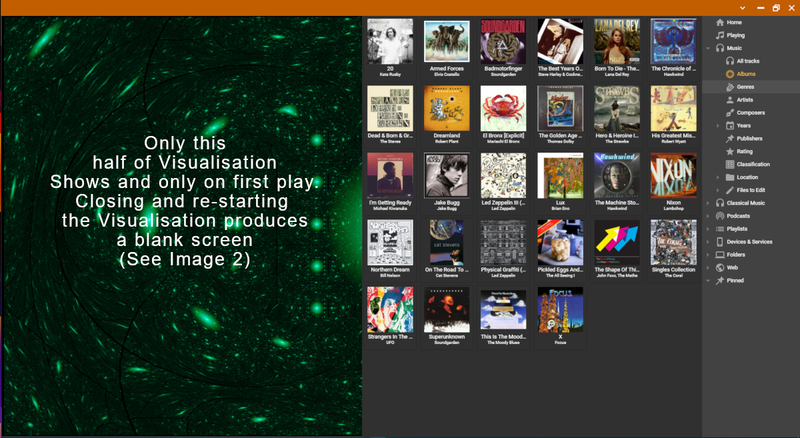 When I uninstalled the portable version and did a full install, the visualiser re-appeared as it should in the album view window in perfect proportion to that window. This remained the case when I expanded the artwork view to the full left-hand side of the screen, as is my preference. Intuitively, I double clicked the window with the visualiser running and I got the blank screen as shown in img 2 in my earlier post. Pressing escape got me back to the situation of img 1, with half the visualisation obscured by the album list. After that, any clicking of "View Visualization" from the view menu will produce the blank screen and no way to get back to the windowed visualization without restarting MM5. Using the screen controls for the visualizer (The option icons for windowed or full screen and the tiny little cross in the top right of the vis window) Cause different problems. 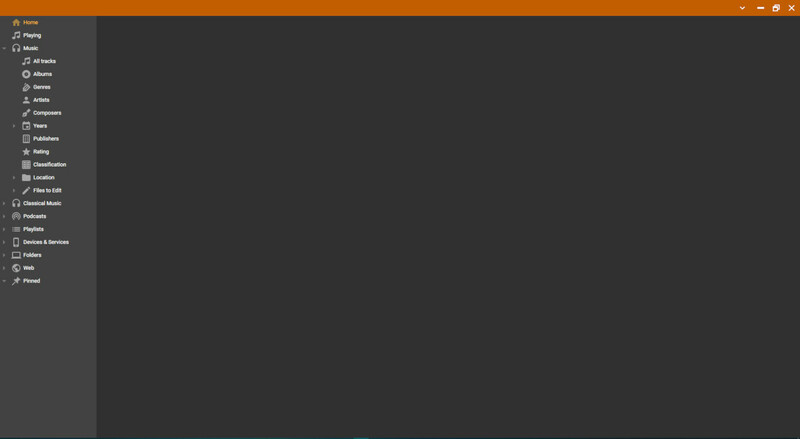 Once I have the visualization working in a window, closing it removes the whole left-hand panel, even though it says it is there in the configure options. The icon on the top bar for viewing left panel is not present. Again, I have to re-start MM5. Whilst I'm here: In the column browser sub menu, when I add the column "Added", it lists the latest items at the bottom of the list (reverse order). Can this either be changed (as it was in MM4) or could users be given the choice of reversing the order of those columns? Thanks for all the great work. It's been worth the wait.